Undergarments. (Rule 3-4.14, page 63) –Compression pants may not extend below the game pants. Shirt sleeves may not extend below the elbow. Rationale: This will eliminate the use of undergarments that extend to the ankle and long sleeves. Arm Sleeves. (Rule 3-5.7, page 65) — Arm sleeves are illegal unless worn for medical purposes. Rationale: Sleeves are unnecessary and inappropriate equipment without permission from a trainer or physician. Wristbands and Headbands. (Rule 3-5.15, 3-5.16, page 64) — Wristbands and headbands must be either the dominant color of the game jersey or white. The color shall be uniform for the entire team. Rationale: This eliminates the problem of finding headbands the same as the dominant color of the game jersey and requires team uniformity. Uni Watch loves how the “rationales” all basically reduce to “Because we said so.” Anyway, the most notable thing is that there will be no more leggings, which isn’t exactly a bad thing. 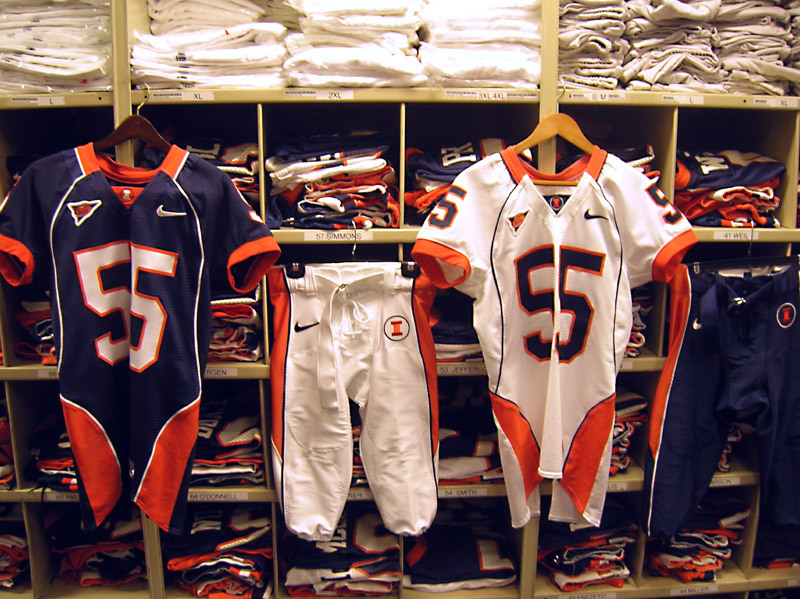 Uni Watch News Ticker: Illinois’s new football unis will look like this. Looks an awful lot like last year’s Clemson design (or just looks awful), no?. … The trend of jersey nibbling (not to be confused with jersey Kleenex-ing) now appears to be spreading. Don’t these guys get enough meal money? … Nice contribution from Daniel Herr, who sends along this 1981 photo … check out the league’s 35th-anniversary patch on the shorts. … Speaking of NBA patches, the little flame on the end of the Heat’s home jersey insignia really does make the O’Brien Trophy patch look a little too close for comfort. … The Twins tried out a really bad idea on Saturday, pairing red caps with blue sleeves. … Two good observations from Jeremy Brahm: (1) “In the World Cup, it looks like the Netherlands will have flag patches on their uniforms for both themselves and their opponents,” as can be seen here in their match against Serbia and Montenegro. … (2) Tsuyoshi Shinjo’s latest stunt: checkered sweatbands. … Remember last year when David Ortiz and Manny Ramirez were wearing each other’s wristbands, and then a few of the Yankees got into the act too? Looks like we’re in for more of that, as A-Rod was wearing Jorge Posada’s wristbands a few nights ago. … Cristiano Ronaldo of Portugal is wearing an odd sleeve style in the World Cup — sorta looks like the sleeves have been slit up the sides. Besides Holland’s, expect the Czech Republic to have flags of the country they are playing on their jerseys. Also, Umbro teams (England and Sweden) had the names of the countries that they are playing in the center of their jersey. you can see the writing there, but its a little too small to read. Does the new NCAA prohibition on “arm sleeves” mean that T-shirt basketball jerseys cannot be worn? Lots of sleeve action today. I noticed Cristiano Ronaldo’s sleeves being normal in the second half too. 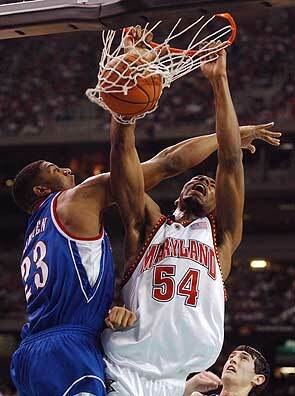 I would think that T-shirt basketball jerseys will be fine as long as they don’t extend past the elbow. And what is up with Shinjo’s one black sleeve and one gray sleeve? Nike has competition as LOGO CREEP, UnderArmour is now selling Award Stickers with the UA logo. How did the boys in Oregon let this one slip by them? Two big problems with Stanford’s baseball jerseys last night in game 2 of their Super Regional against Oregon State… first of all, I had kinda hoped that the pull-over, no-buttons, V-neck look had died with the end of the 1980s, but I guess I was wrong. Secondly, the American flag patch on their right sleeve is backward, with the field of blue facing the rear. Kinda tough to see the flag patch in these pictures, but you see what I mean about the jerseys (go to the “super regional…” link under June 12 on the website). On the flip side, I kinda like OSU’s black with orange jersey. Have you noticed that the refs in the NBA Finals have some sort of patch on their left sleeve? I haven’t been able to get a good screen capture of it because their sleeves are so bunched up, but there looks to be a white patch on the sleeve. *sigh* and another distant tradition gets a final nail in its coffin. Remeber when Evansville wore T-shirts as their jerseys for many years? Those stripes at the bottom of the shirt tails of the Illinois uniforms make no sense, wouldn’t they be concealed, tucked into the pants? Perhaps they match the new nike jock straps. Not jersey nibbling, but in the college baseball super regional coverage, a lot of self-spitting. Spitting onto batting gloves between every bat, and UNC has a player who spits on his fingertips, then rubs it across his chest. Maybe OCD meds are in order? 1. I think Evansville would still be able to wear their “t-shirt” jerseys. Those are different than putting a t-shirt underneath a traditional uni. 2. The 0-5 deal with uniforms has to do with administering fouls. When a referee reports a foul, he/she does it both verbally and with a hand signal (they use two hands for all numbers – one hand is the tens digit and other is for the ones). Obviously, you can only do this if the numbers don’t go higher than 55. On the chewing topic, has anyone has yet cited Matt Williams chewing on/biting his left sleeve when in his batting stance? I could be crazy, but I think remember hearing he did it to keep his left elbow up when at bat. Can’t find a picture of it, but upon googling found someone mentioning it here. OSU Beavers unreal hat, great jersey, better name. What college baseball teams have the best hat? LaSalle (when Tom Gola played); Texas A&M (under former LaSalle coach Ken Loeffler); LIU, under the legendary Clair Bee; North Carolina; the Baltimore Bullets; and the St, Louis Bombers. Doubtless there were a good many more. As recently as three years ago, the University of the District of Columbia featured them, as well. TRIVIA FACTOID: Despite that Evansville is known as the “Purple Aces,’ in their T-shirt days the jerseys were orange. Do any college teams still wear them? am no fan of soccer but am loving all the weird, garish, and outrageous soccer unis! let the carping, critizing and even praising begin! The Netherlands jerseys are amazing! The “deer stand orange” color is a reference to King William III, also known as William of Orange. He was the man responsible for the independence of the Netherlands, and his flag, the tricolor of orange, white, and blue, was adopted by his rebel group and eventually became the flag of the Netherlands. This is the reason that the Dutch uniforms are orange and blue. Correction, the Netherlands flag is red, white, and blue, but William’s original had orange. argh! we have just given up another goal to the CHECKS (we’re losing to a country named after a banking instrument?) and it is clear why we are giving up goals. OUR GOALIE IS WEARING A GREEN JERSEY. hello! we’re not the IRISH. we’re the USA. get a red or white jersey, sir. we’re never going to win like this. The preceding post is correct (except the part about t-shirt jerseys being weak) — the sleeve ban refers to AI-style slide-on sleeves, not t-shirt sleeves. Is it just me, or is this just another example of the NCAA making rules for the sake of having rules? watching college world series action and wondering what the little black dot is in the middle of the bills of the nike batting helmets? it’s easy to see on teams with light colored helmet bills. Anyone know? About Kasey Keller’s goalie jersey being green, not red or white- I don’t know why he didn’t choose red, but he couldn’t have worn white because the Czechs (shockingly not actually named after a banking instrument) were wearing white, and the goalie has to be a wearing a different color than both teams. Also, it could have been worse- the Italy goalie is wearing all gold. As an alumnus of Evansville, it’s kind of weird seeing such a small school being discussed. UE’s colors are purple and orange, and I believe the reason they wore bright orange jerseys was because the coach believed they could see each other better on the court. If I remember correctly, they tried the orange colored jerseys again during the late 90s, but only lasted a couple seasons. Why I know this? Who cares. During the Ghana v. Italy game, I swore I saw a Ghanian with the wrong socks on. Instead of the white with black trim that the rest of the team had, he was wearing the black with white trim. No photo evidence as of yet, but I’m still digging. I also saw Ghana forward # 19 Razak PIMPONG come in with black socks, but then he changed to white. Ghana’s unis also changed, they used to be all yellow. Why the change to all white? The “both countries flags” thing comes from the awesome tradition of teams swapping jerseys after world cup games. It’s cool for a Croat to have his flag on the Netherlands jersey he takes from that game. The keeper jerseys aren’t supposed to be representative of his country (in color). My main problem with Keller’s jersey was that he chews on the neck like crazy, and it shows. Sorry, thats kinda strange to me. Anyone that is up on the soccer thing have a reason for dating the jersey? Regarding the college basketball numbers, only NCAA women’s officials use two hands while giving the number to the table. In NCAA Men’s and most high school games, the officials only use one hand. They simply give the tens first, then the ones. In international ball (FIBA), the only allowable numbers are 3-15. Each number has a defined hand signal because there are often language barriers between floor and table officials. For numbers 3-5, you simply give the approriate number of fingers on the right hand. For 6-10, you hold up five fingers on the right hand and the remaining numbers on the left. For 11-15, you make a fist with the right hand — representing 10 — and then give the remaining numbers on the left hand. did anyone else notice georgia’s jerdeys today in the cws game against south carolina? what was going on with the little black armpit panels? i’ll look for photo evidence. It looked awkard to me. I think the white-blue-white and blue-white-blue patters work best. It’s how they were intended! It should be noted, this is nothing new from the NCAA; they make all sorts of this kind of rulings regarding uniforms. You should see the details in the basketball rulebook on what exactly is allowed not only on the actual game jersey, but what is permitted on the team’s warm-up outfits (as well as what can and cannot appear on the actual playing court [i.e. : logos, wordmarks, and court lines]). One of the years while I was in college, they would not allow a corporate logo (i.e. : Nike swoosh, Adidias three-stripes, Reebok logo) larger than a certain size on the warmup tops. Half of the schools in our little Division II league had players wearing warmups with tape over the logos (so that the team was following the rules). Two seasons later, after all the manufacturers has adjusted the logos on their standard warm-ups, the NCAA changed the rule regarding the size of the logo (which would have made the old warmups “legal”). On the uniform numbers question, one additional point: those numbers are not only used by the referees when indicating fouls; they’re also used to show who called a timeout. Why is this important? Well, there is a notation in the standard NCAA scorebook for who called a timeout. The scorer has to indicate in the scorebook not only which team called the timeout, but the player’s number as well (If called by the coach, a “C” notation is made). It’s there so that there is a way to tell the difference between a team-called timeout, and a media timeout for radio or television (which is noted differently). Soccer Goalie jerseys are traditionally (but certainly not always) green. Since they have to wear a color that is differnet from the two teams on the field green was a good choice as a regular jersey seeing that there aren’t that many teams with green. When the other team had green, they’d have to find another of course. Am I wrong or was the Ghana goalie’s name misspelled on his jersey? Regarding the Ghana ‘keeper: yes, it read Kingson, right? I also must admit the new lily white Ghana kits were SHARP ! We’ve seen some nice, some garish and some heretical treatments to otherwise wonderful and traditional kits. Take Argentina for instance…. why did adidas feel the need to stick what appears to be a blob of light blue at the shoulder, when all that jersey requires is the traditional sky blue/white bars? Horrible! And I always considered adidas to be the lesser of the transgressers…. I must ask…What is the problem with a basketball player wearing the “tights”. I cannot come up with a reason that the “sleeves” or “tights” are a problem. That is like telling the Pitcher that he cannot wear his warm-up coat to run the bases on a cold night. Same for NFL, and the QB cannot wear longsleeves while his line-men don’t. Please explain what detriment wearing the sleeve and tights causes on the basketball court?